After 8 hours of cooking, researching, and testing we’ve concluded that if you have taken the plunge and gone vegan, and are craving some of that Korean goodness, CJs and trumpet mushrooms are your best bet for some great vegan bulgogi. May your beer always be cold and your meat, I mean, fungi be sizzling…. As should be made abundantly clear by the great sacrifice Goku and Vegeta made many years ago, we’re not looking for a stand alone hero carrying all the weight here, we’re looking for a fusion of two distinct forces into one great vegan bulgogi. A little anticlimactic I’m sure, we’ve already mentioned how great CJ’s marinade is before, I also wouldn’t be surprised if trumpet mushrooms are a perennial favorite of most vegans, but good is good. The trumpet is the unquestionable King here, shiitake’s do alright but we’re looking for the best vegan bulgogi, not an alright one. CJ’s signature balance is more important than ever with such a delicate product as opposed to the more robust… meat. The saltiness that most marinades come with would be completely overpowering. If you happen to be of the green variety CJs and trumpet mushrooms are the way to go for a great vegan bulgogi. We here at Goghism accept all colors and creeds… but a major life changing event notwithstanding I’ll be in the meat department. But as always, you do you fam. I have to come clean with something that’s been keeping me up at night, it’s starting to affect my work and I already have enough things to stress about, what with Dom possibly going against Family and everything. 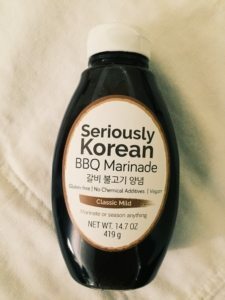 We were joking amongst ourselves while we were updating our Bulgogi Marinade post about how Seriously Korean proudly emblazoned ‘Vegan’ on their label. I mean… they ain’t lying, but that’s like Dasani bragging about their water being GMO free. What’s been bothering me though is the fear, the nagging doubt, that maybe our indignant carnivorous elitism has blinded us to a beautiful truth. Maybe they’re onto something, maybe it’s not a coincidence that the only marinade with mushrooms in the ingredient list was also the only one drawing attention to their vegan-ness. So we’re going out on a limb here, in part to soothe my conscience, in part to throw a bone to our tree hugging brothers and sisters, but also to follow the immortal David Chang in saying anyone can make meat taste good — give me a challenge. Portabella – Immediately I could tell that texturally this is way too soft, it almost disintegrates in your mouth. 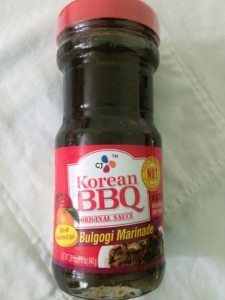 Since bulgogi and kalbi marinades are meant to be balanced with a fatty piece of meat, this comes off as way too salty and almost sour. Button – Texturally this one holds up a little better than the portabella. Taste wise as well, I was surprised that it actually came out at all. However, there is a slightly bitter aftertaste from the mushroom’s natural juices (i.e. fungus water). Shiitake – Texture may turn people off, a little gummy but definitely tougher than the portabella. There is a slight acidic tinge at the end that for some reason makes it taste more ‘Asian’. Overall this was the most familiar in terms of flavor profile wise, but since it’s mainly added as an enhancement to sliced ribeye I can’t help but notice the gaping hole left in its absence. Trumpet – When it comes to texture this is clearly the winner (no surprise there). It’s the only one that has an actual ‘chew’. Definitely still not meat but the only one that has some level of satisfaction that you feel in your gut. Taste leaves a little to be desired, the juices are a tiny bit bitter, but that seems pretty standard for mushrooms here. Conclusion – Somewhat anticlimactic but the Trumpet was by far the best. It definitely did not approach a standard bulgogi (if that’s what you’re shooting for you won’t get it) but it could definitely stand on its own as an entree, the rest were condiments at worst, side dishes at best. There’s definitely a lot of potential for bulgogi shiitake mushrooms if you want to put a nice twist on your burger or steak… but that defeats the point of the whole vegan schtick. 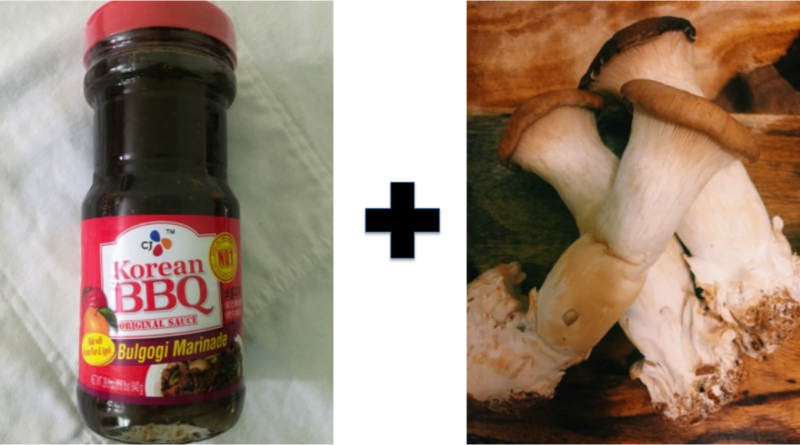 Portabella – I know in our bulgogi marinade post we loved the balance of CJs and how it let the meat be the main attraction. No surprise that it works the same here as well, with the opposite effect as with Seriously Korean. While the previous marinade came out as too salty and overpowering (since you’re basically biting into a marinade sponge), this was much milder and smoother. Texturally we still faced the same problems, too soft, with no chance of a satisfying bite. Button – Again this beat out the portabella in terms of texture. One major change I highly suggest is not slicing the mushrooms (as we did previously), leave them whole. It won’t miraculously turn into steak but it definitely gets closer to something you can chew on for a bit. If you’re a fan of Gordon Ramsey’s marinated mushrooms this could easily give it a run for its money as the Asian cousin. Shiitake – Definitely comes closest to tasting like the real thing, even if you don’t go vegan you would only doing yourself a favor by slicing a few of these suckers up and throwing it in with your bulgogi. Alone it’s still too gummy, leaving them whole definitely helps, but I can see it being a combination of soft and rubbery that might be too unfamiliar for some. Trumpet – No question this will always be your best bet out of the four. When the game comes down to structural strength and integrity you can’t beat the King [Oyster]. Slicing this up and throwing it on the grill over hot coals will be the closest you can get to mollifying the carnivore within us all. Conclusion – This definitely worked out better than Seriously Korean, which is ironic given that they started this whole mess. It’s overall balance and relative mildness paired much more intuitively with the subtle flavors of the mushrooms. However, it still comes out as pretty strong, if you want to treat as an entree I would use the marinade sparingly and add gradually to taste. If you want a strong side dish or condiment (think if pickles were savory instead of sour) pour away. Seems kind of contradictory bringing up a vegan option after having spent so much time trying to build credibility in the world of meat. 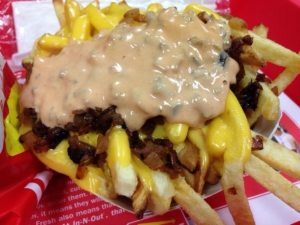 I once ate two Double-Doubles and a large Animal Style fries by myself in a parked car without any utensils or napkins. When two mini vans pulled up beside me I just put my face in my hands in shame until they had gone… so I have some street cred. Given that, we’re not pretending to be Vegans here, we’re not trying to make you feel inferior for putting that baby cow’s rib in your mouth; You do You. We’re going to approach this the same as any other dish, the only thing that matters is how it tastes and how clean your plate is after, not how close it comes to the real thing. We chose the first two for their availability, wide spread usage, and familiarity with the sautée. 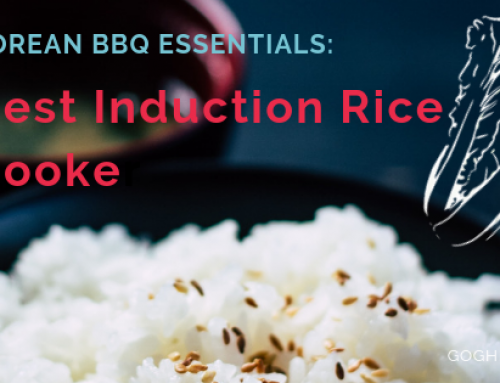 The shiitake was a necessary addition, both as it is commonly added to enhance a standard bulgogi already and for its penetration in Asian cuisine. Some people might prefer the enoki but it is too delicate a product to stand on its own when sautéed, better to put it in a nice broth. Lastly, we had to go with the King Oyster because, let’s be real, can you think of a meatier fungi? We’re going to stay away from the more common meat substitutes such as seitan or tofu, for now, because we’re shooting for a dish that can exist on its own. If your goal is to make a vegan dish that tastes BETTER or at best comparable to the non vegan version you’ve already failed. Your mind will constantly be thinking of the meat you would rather be eating. In my own personal experience, I’ve lasted the longest (like four days) when I wasn’t trying to make vegetables more than what they are; not expect them to replace a steak. I mean c’mon, a carrot or a mushroom’s never going to be as good as a slab of beef, some cheddar and a “couple” slices of bacon. This was more fun than we had anticipated (not as fun as the kalbi post but definitely piqued our interest). We’ll use this post to explore the vegan option more thoroughly. 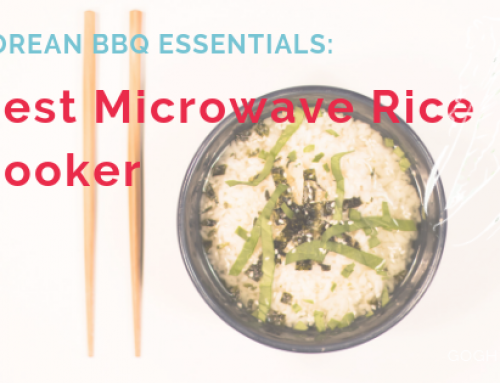 You can expect more mushroom types, some meat substitutes, and additional sauces and marinades shortly. 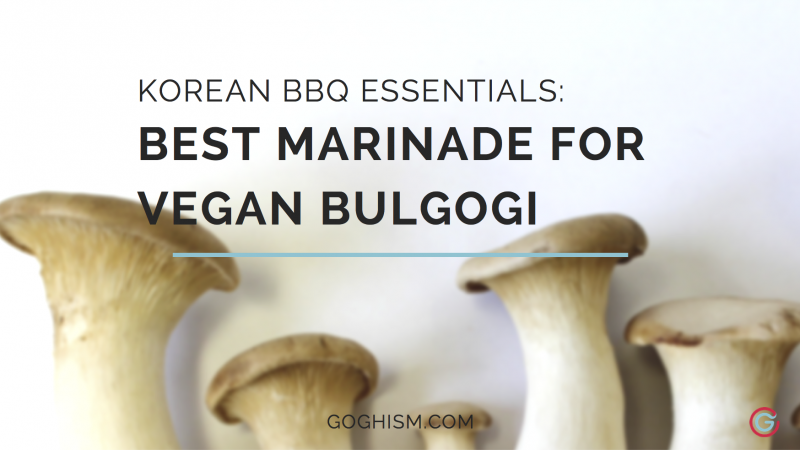 The main takeaway is that if you have a favorite bulgogi marinade don’t change it up now. The flavor profiles did not change all that much given the subtle nature of most mushrooms and the boldness of the marinades. The main decision here is really on textural preference. Leaving the mushrooms whole helps out a ton with the button and portabella, with the shiitake as well but it won’t lose the gummy almost sliminess that will turn some people away. Can’t stress this enough, if you can get ’em go all the way and spring for the trumpets, they’re only a couple bucks more.